This riveting book follows a small group of Australian front-line soldiers from their enlistment in the dark days of 1940 to the end of World War II. No ordinary soldiers, they were members of Don Company of the Second 43rd Battalion, part of the famous 9th Australian Division, which — during campaigns in Tobruk, El Alamein, New Guinea, and Borneo — sustained more casualties and won more medals than any other Australian division. It is an evocative and detailed account of the day-to-day war of three infantry soldiers whose experiences included night patrols at Tobruk, advancing steadily through German barrages at Alamein, charging enemy machine guns in New Guinea, and repelling Japanese charges on Borneo. 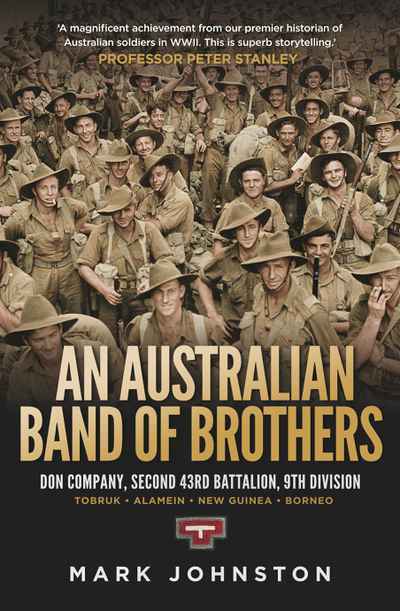 Inspired by American historian Stephen Ambrose’s landmark book, Band of Brothers, about the US Army’s Easy Company of the 506th Regiment, Mark Johnston, one of our best military historians, here gives an Australian company the same treatment. Using the frank and detailed personal letters, diaries, and memoirs of three Australian soldiers, he brings to life their campaigns, battles, and interactions with their comrades and enemies. His book is a unique and powerful account of the everyday experiences of a small unit of Australian soldiers on the front line.